Is there any one who do not like the freshly baked bread or its aroma.I love it. 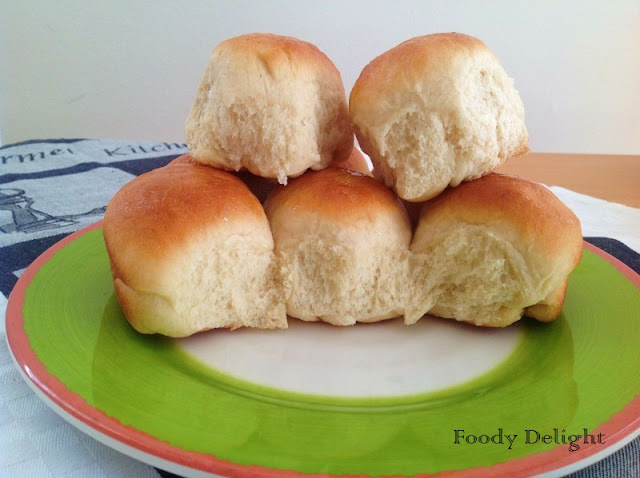 These are my favourite homemade soft puffy dinner rolls or Indian pav bread. 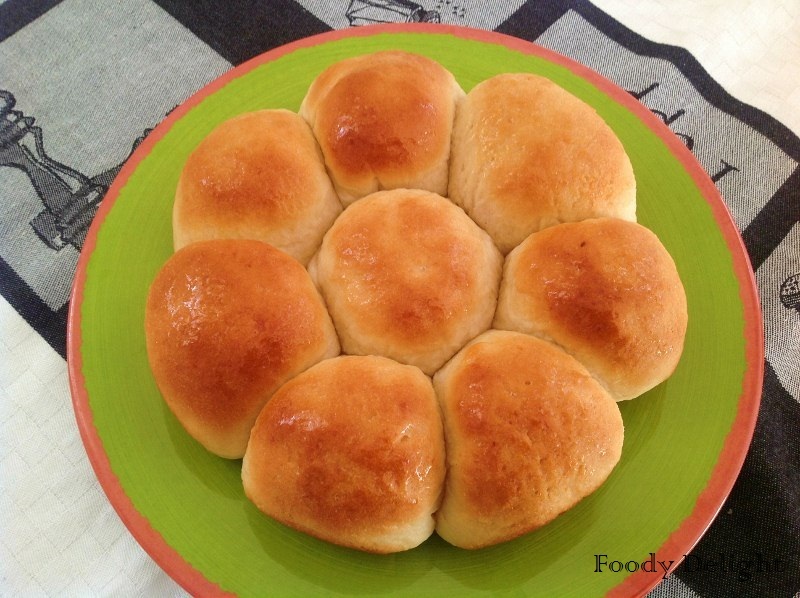 These bread are really easy to make and flavour of its is awesome. I baked these bread in 8 inch round cake pans. You can also make loaf bread with the same dough.These pav were really soft and had a great texture.So I am sharing this recipe. Combine all the dry ingredients in a large bowl. Mix and knead - using your hands, a stand mixer to make a soft, smooth dough. Place the dough in a lightly greased container.Cover the container, and allow the dough to rise for 60 to 90 minutes, until it's just about doubled in size. Gently transfer the dough to a lightly greased work surface. Divide the dough into 16 equal pieces, by dividing in half, then in halves again etc.Round each pieces into a smooth ball. Lightly grease two 8 inch round cake pans.Space 8 pav bread in each pan. You can also use 9 inch round cake pans or a 9 inch * 13 inch pan. Cover the pans and allow the pav bread to rise till they are crowded against one anotehr and quite puffy about 60 to 90 minutes. 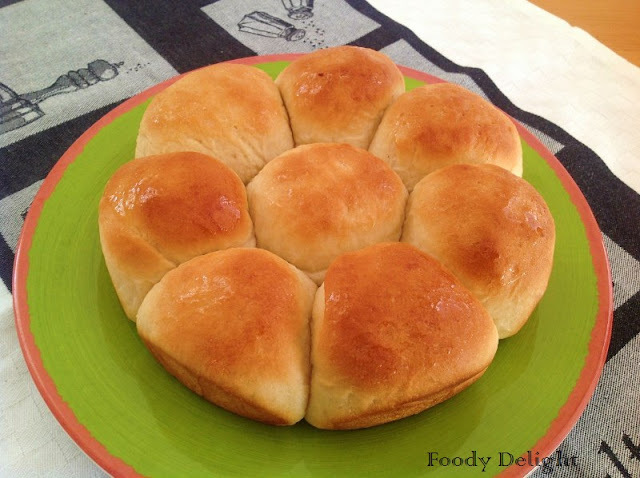 Towards the end of the rising time, preheat the oven to 350 F.
Uncover the pav bread and bake them for 22 to 24 minutes, until they are golden brown on top and edges of the center bun spring back lightly when you touch it. Remove the pav bread from the oven and brush with the melted butter.After a couple of minutes, turn them out of the pan onto a cooling rack. Serve warm.Store leftovers well wrapped at room temperature. Aww, they look super soft n yummy! Nice recipe dear..